Say hello to your new favourite muffin. They’re a breeze to whip up…and have the chunkiest crumb topping EVER. I’m seriously so in love, and ate wayyyy too many of these while shooting their photos. Ha! They taste like Fall even before I drizzled them with caramel (an optional, but totally not optional addition), and they make your house smell like HEAVEN. Since they have apple chunks in them, I find that they’re at their best on the same day you bake them, but they do freeze well if you manage not to devour them all in one sitting. My family’s been in full on apple mode for a whole month now on our apple farm! So you could say that apples have been on my mind A LOT lately. I’m pretty sure that picking apples on a foggy morning in Fall is one of my very favourite things to do in the world. Seriously magic. 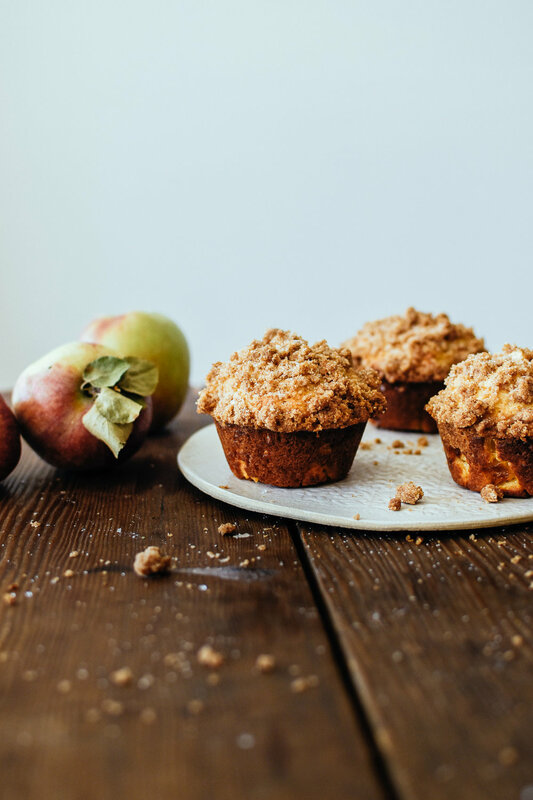 Now, go find a local apple farm, and go pick some apples…and then make these magical muffins. Just do it! 1) Preheat your oven to 350 degrees F. Grease your muffin tin/s, and set aside. *Note: I used two muffin pans and alternated my batter to go “batter, no batter“ and then the opposite for the next line. This helps the muffins rise a bit better, but can be skipped if you’re short on oven space! 2) First assemble the crumb topping: In a medium bowl, stir together sugars, cinnamon, flour, and melted butter. The mixture will form crumbs as you squeeze it in your hand, and you can control how large of chunks you want. Place mixture in the fridge until ready to use. 2) In a large mixing bowl, cream together the sugars and softened butter. Beat in the eggs, one at a time, until well mixed. Mix in greek yogurt and vanilla extract on low, scraping down the sides with a spatula as you go. 3) In a medium mixing bowl, sift together the flour, baking powder, and salt. Gradually add to the wet mixture, mixing on low, until mostly incorporated. Use a spatula to scrape down sides, and then gently fold in apples. Your mixture will be very thick! 4) Use an ice cream/cookie scoop to place the batter into the prepared muffins pans. I skip every other muffin spot to get even higher muffin tops! So: batter, no batter batter. And then the next line will be: no batter, batter, no batter. Not strictly necessary, but it does help the muffins get a better rise! Add crumbs to the tops. 5) Bake muffins at 400 F for the first 5 minutes, and then reduce the temperature to 350 for the next 12-15 minutes. Total cook time: 17-20 minutes, or until you can insert a toothpick and have it come out clean. Note: cooking times may vary depending on your oven. 6) Remove muffins once done, and allow to cool for 5-10 minutes before removing from their pan. Serve warm! Add a caramel drizzle if desired. First get all of your ingredients in place, as making caramel is a very time sensitive activity. It is best if the cream and butter are close to room temperature. In a medium-large saucepan, heat sugar and water on medium high heat until it starts melting, resist the urge to stir, as that can cause crystallization. Once the mixture begins simmering, gently swirl the post in a circular motion. Continue to cook caramel until you see it turning yellow. Keep swirling occasionally to help sugar cook evenly. Let the mixture come to a dark amber colour, and immediately remove from heat. Whisk in the butter, and stir until incorporated. Add in the heavy whipping cream and salt, and again stir until incorporated. *Be careful in these steps as the mixture will froth quite violently! The caramel sauce will look quite thin, and that’s normal! Let the caramel sauce cool for at least half an hour before placing in the fridge. Allow it to cool and thicken completely before serving. Store in the fridge in an airtight container - it will last about a month.